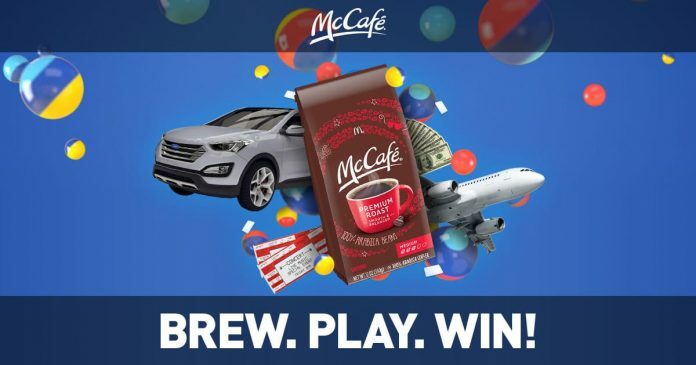 McDonald's McCafé Instant Win Game : Brew. Play. Win! McDonald’s McCafé Instant Win Game (www.mccafeinstantwin.com): McDonald’s is giving away thousands of prizes including a new SUV, a 5-day vacation for 2, and gift cards during the McCafé Instant Win Game. To participate, purchase a specially-marked bag of McCafé coffee and enter your on-pack code online at www.mccafeinstantwin.com. You may enter up to 5 codes through September 1, 2019. Instant Win Game begins at 12:00 am ET on April 1, 2019 and ends at 11:59 pm ET on September 1, 2019.
address/person, regardless of method or combination of methods of obtaining Codes. https://bit.ly/2ScsTcj. The winner list will be posted after winner confirmation is complete. Sponsor: Kraft Heinz Foods Company, 200 E Randolph, Suite 7600 Chicago, IL 60601.